Is this the same as Game Show Mania? Game shows are part of the fabric of our society. Game shows have been “on the air” since the birth of radio and were some of the first programs televised. For years, millions of families have gathered each night to watch Jeopardy! ®, Wheel of Fortune ® and Family Feud ®. In the nineties, shows like Who Wants To Be A Millionaire ® and The Weakest Link ®dominated the ratings. In this millennium, Deal or No Deal ®,and Are You Smarter Than A Fifth Grader ® continued the trend. Why have game shows remained so popular for more than eight decades? Because nearly everyone has fantasized about winning big bucks on a TV game show. 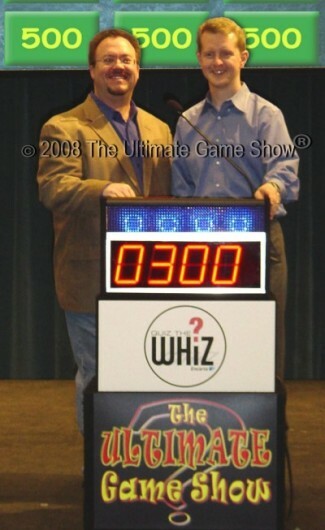 Due to their popularity, game show productions are one of the most requested forms of corporate event entertainment. Ultimate Game Show ® presents custom game shows at any level: from a basic trivia game show to a full-scale TV-studio quality production. Your group can experience the energy and excitement of a live TV-style game show at your next national sales kick-off, training meeting,team-building session or banquet. You can choose from more than four dozen game show formats. Ultimate Game Show ® is one of the very few (about a half dozen) legitimate full-time, full-service game show production companies in America. As game show professionals, all of our corporate game show productions feature the most experienced game show hosts available.With more than twenty years experience in the entertainment and corporate training industries, Bryan Quinn (our founder and president), has hosted more corporate game show events than anyone. But if would prefer to add a hollywood celebrity to host your game, we have a wide assortment of TV game show hosts, actors and comedians available. All of our celebrity hosts can also act as the emcee for your entire event. Rates vary by celebrity and range from a few thousand dollars to $35,000. 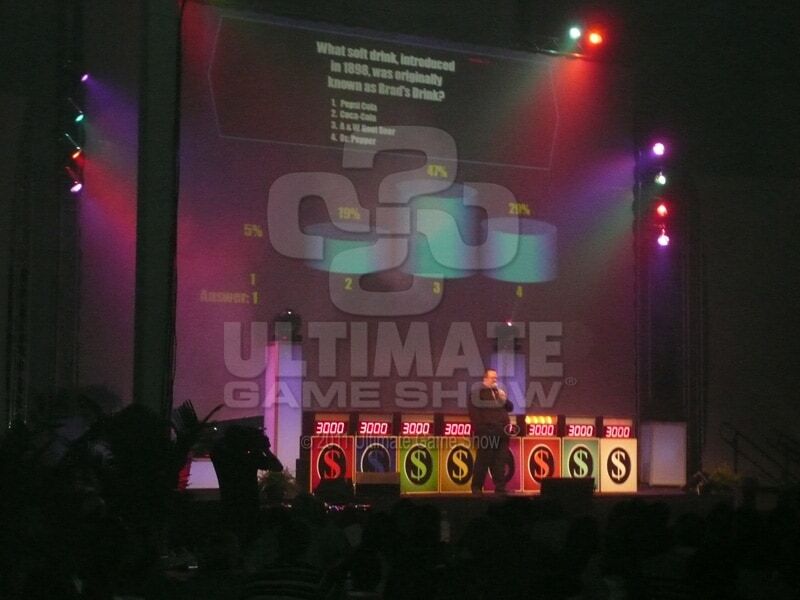 Ultimate Game Show ®provides state-of-the-art equipment for all of our game show productions. In addition to the contestant podiums with microphones and lock-out buzzers, we can also provide backdrops, video screens and projectors, sound systems and lighting, and all the professionally trained technicians required. If you are planning a multi-day conference, we can provide our audio/visual equipment and technicians for the entire event. Or if you have already made other arrangements (as is most common), we will work with your providers to integrate our necessary game show elements into their equipment. 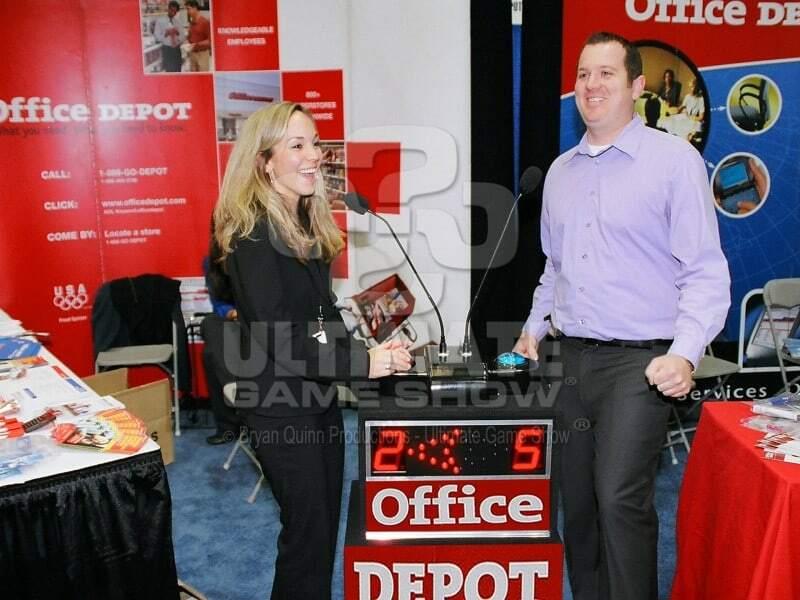 Be sure to check out the video clips of Ultimate Game Show ® in action. Everyone Loves Game Shows. Now Your Guests and Your Customized Content Are The Stars Of The Show! Our mobile game show productions feature all the glitter, flash, and fun of a TV studio production : music, lights, electronic scoring, sound effects – all the bells and whistles! We offer Audience Response Wireless Keypad based game shows giving the benefit of 100% participation as every member of your group enters their responses to game show, training or survey questions. We’ve developed dozens of game show formats– many are exclusive to Ultimate Game Show, but we also have recreations of most popular TV games shows. Our newest entertainment option, Ultimate Derby, offers clients a high-energy night of horse racing featuring animated races and a professional horse race announcer. Many of our game show formats can be presented as team building experiences, but we’ve also built team building programs around poplular reality TV shows as well. This is perfect for all types of events!!!! Whether you’re planning a sales conference, product launch, team-building event, trade show booth/marketing activation, or executive retreat, this is the perfect solution. We guarantee your employees and/or customers will have an absolute blast living out their “game show contestant fantasies”. With our programs, everyone can be included in the game or we can highlight select VIPs. Your content becomes the show! We will work with you to create a customized game show experience where your sales/training material is reinforced throughout. Scientific studies have shown that a game show activity can increase information retention by more than 30%. Here’s a Quick Video Showcasing Some of Our Game Show Events. We can provide game showa as a keynote, training session, a team building program, or marketing campaign! 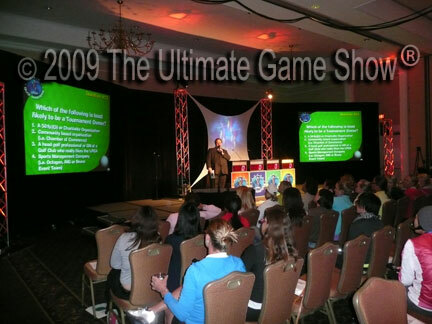 Ultimate Game Show® can be presented at pretty much any type of event, anywhere across the nation. So no matter what type of event you are planning, you and your guests will love our high-energy game show entertainment. 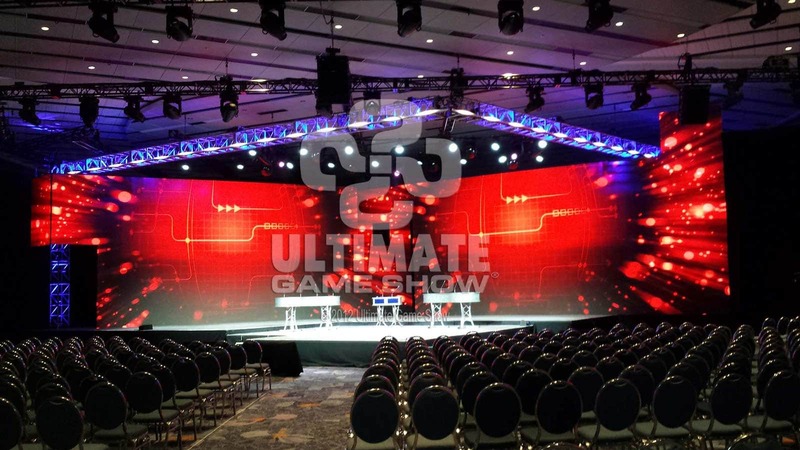 From a small mobile game show with a few contestant podiums and a small sound system to a full-scale game show production like those seen in the photo to the left, Ultimate Game Show® will make your event a huge success. Our fast-paced, customized game show productions will add interactive fun to any function! 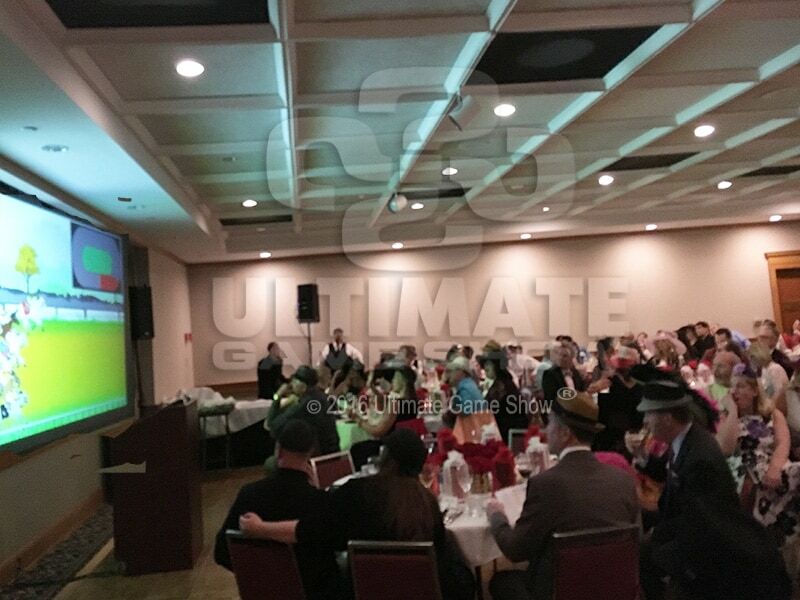 Ultimate Game Show® has performed at every type of event imaginable. Since every event we do is completely customized, it is impossible to describe everything that we’re capable of here on the website. But the bottom line is that when it comes to game shows, if you can think it, we can deliver it. Be sure to look through the various event type pages found in the sub-directory when you click on the Event Types menu button.We can present game shows for groups of only a few people, or large events with thousands of attendees. 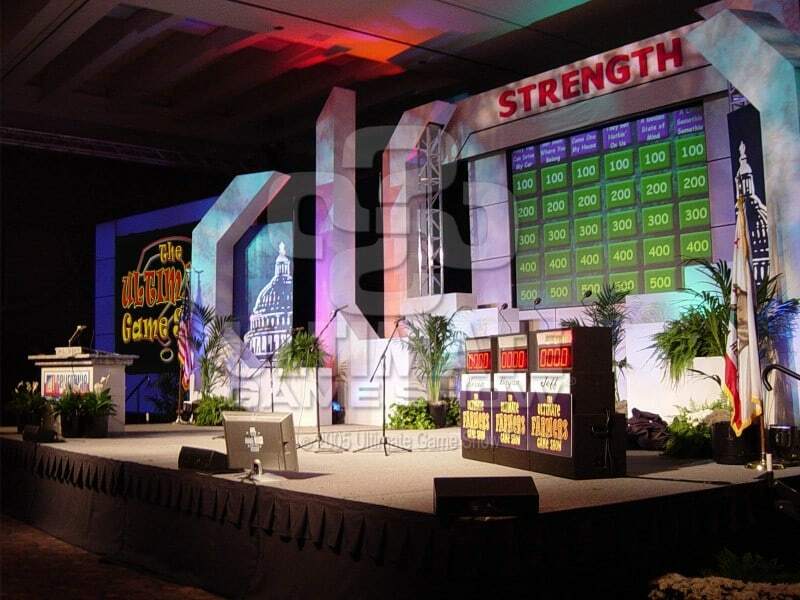 Just call our office and one of Ultimate Game Show’s Event Consultants will help you determine which level of production and game show format is the best fit for your event. Click on one of the photos below for more information on these general types of events. You won’t find a more popular entertainment option for conferences, conventions, sales meetings or banquets. Our interactive game shows have proven to build stronger teams and increase retention of training material. 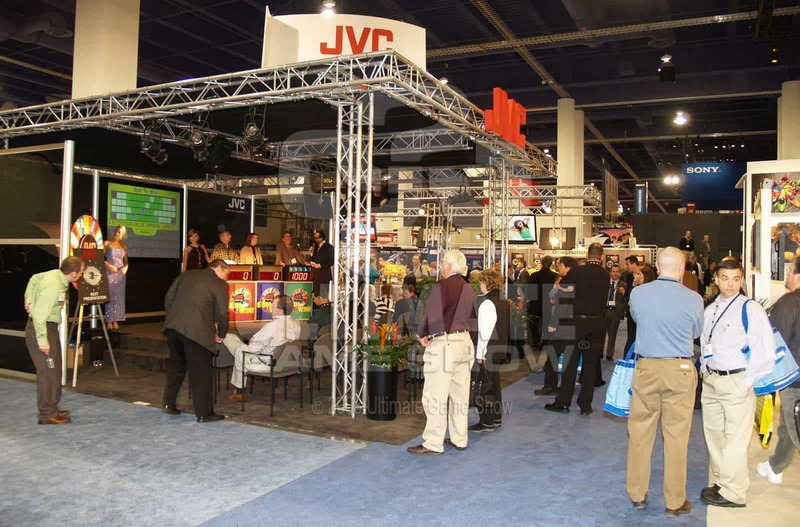 We will draw crowds and gather leads at trade shows, marketing activations or other promotional events. I’M SOLD! I NEED TO HAVE ULTIMATE GAME SHOW AT MY EVENT! Ultimate Game Show® offers stage-based game shows, audience response keypad based games and our new animated horse racing. 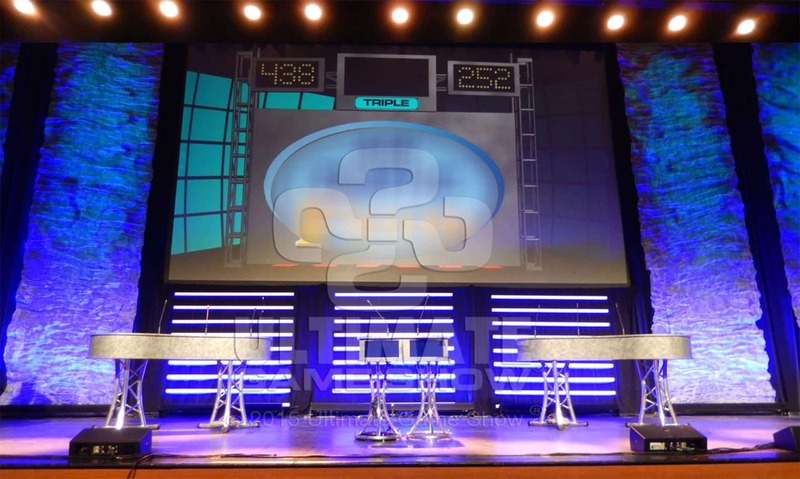 Ultimate Game Show’s custom built game show podiums/set pieces and our exclusive proprietary game software will bring the “Wow!” to your event. 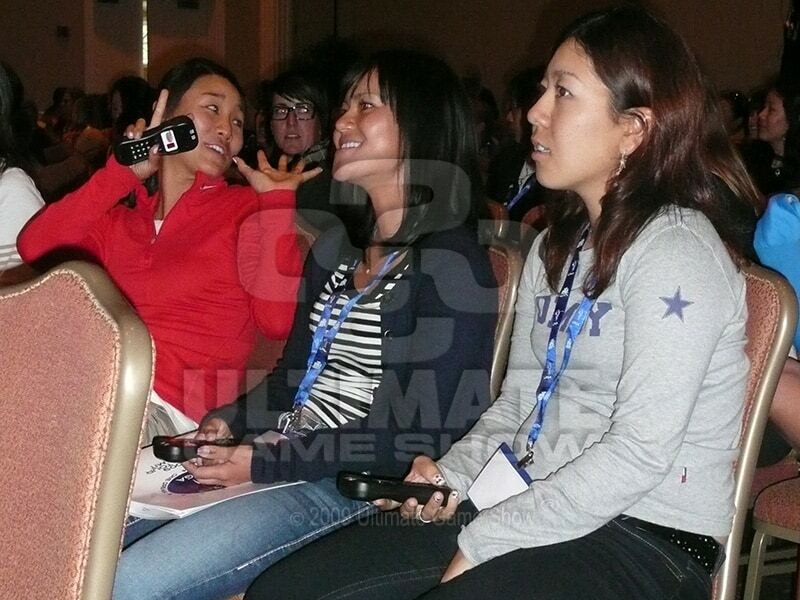 Audience Response Keypads Involve Everyone! Ultimate Game Show’s audience response keypads and proprietary game software involve your entire group for total interaction. Ultimate Game Show’s Ultimate Derby brings all the excitement and energy of real horse racing to your event. Your crowd WILL go WILD! Our On-Stage Game Shows Bring The Flashing Lights, Bells and Whistles of Hollywood to Your Event. They say “Go big or go home”. You will get big-time responses to our on-stage game show producitons. Whether we’re presenting one of our proprietary original games or a recreation of a popular TV show, your crowd will love it. Click the photo above for more information about our arsenal of on-stage game show podiums and set pieces. There’s Nothing Better Then Looking Across The Room And Seeing Everyone Playing Along. Leave no man behind, they said. So we developed game show formats that include the entire audience rather than just a select few. Choose from team or individual play, but the total participation is the same. Click the photo above for more information about our wireless audience response system, which is available for non-game uses as well. You Will Not Believe How Excited People Get Over Our Cartoon Ponies Until You See It Yourself! And they’re off! Six animated horses (named by you and/or your guests) are racing down the front-stretch. The ENTIRE room is screaming for them to run faster and these hand drawn horseys just might hear them! Click the photo above for more information. We offer multiple wagering formats making this the perfect alternative to casino nights. We can track each contestant’s responses for follow up training. Ultimate Game Show® is the Nation’s premier game show production company! 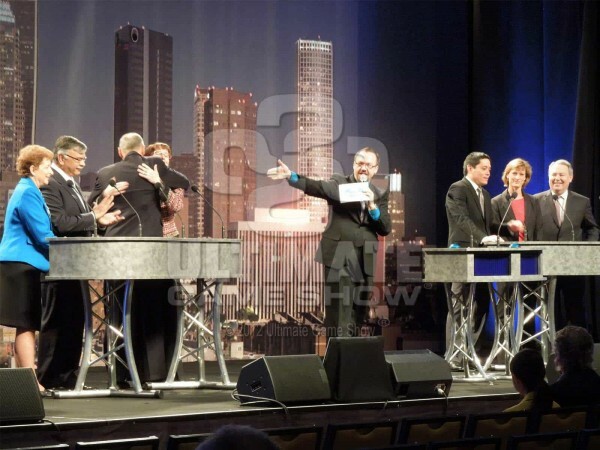 The Ultimate Game Show presents Corporate Game Show productions and customized game shows for companies all over the country. Ultimate Game Show is the perfect solution to all of your corporate entertainment and training needs. 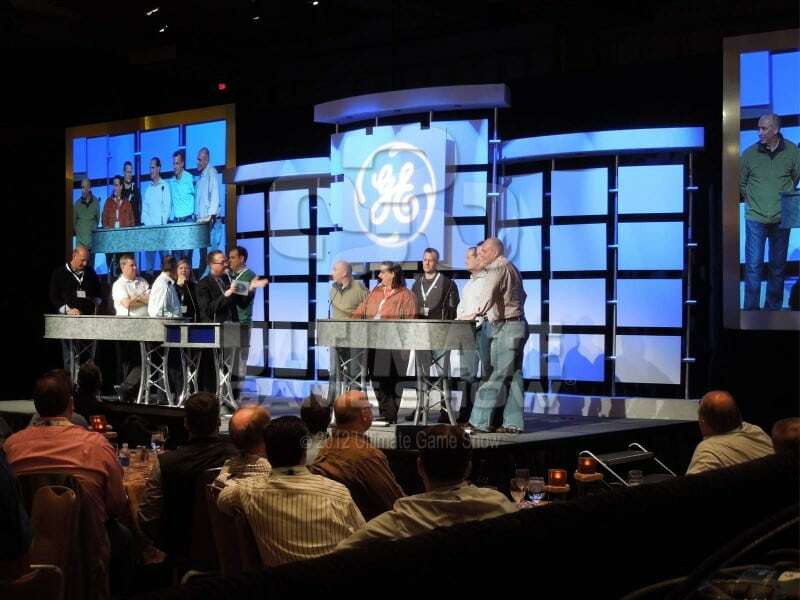 Ultimate Game Show® offers corporate game shows perfect for banquet entertainment, employee training or team building. Let the Ultimate Game Show team create a custom game show for your group. Our mobile game shows bring all the energy and excitement of a real live TV-style game show to company events. We don’t simply rent out Game Show Mania systems, we present full game show productions including all necessary game show equipment, proprietary game show software, audio, professional technicians and the most experienced game show hosts available. And if needed we can usually provide all necessary audio, visual, lighting and scenic elements for the game show portion and/or your entire event. The bottom line is…We know game shows! And we also know remote control NASCAR-style racing. Visit our other company Checkered Flag Interactive Racing to learn more. What are you waiting for? 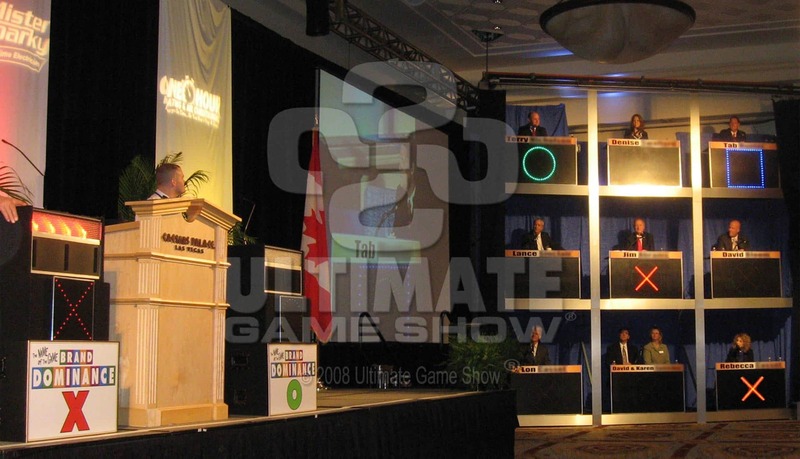 Ultimate Game Show is ready to help you create a successful corporate or promotional event with a custom game show production. Entire contents © 2001-Present by Ultimate Game Show® a division of Bryan Quinn Productions. All rights reserved. Ultimate Game Show® is a Federally registered trademark. Ultimate Game Show® and Bryan Quinn Productions are not affiliated with any TV game show production. Jeopardy!®, Wheel of Fortune®, Family Feud®, Who Wants To Be A Millionaire®, The Weakest Link®, Deal Or No Deal®, 1 vs. 100®, Are You Smarter Than A Fifth Grader®, and America's Got Talent® are all registered trademarks of their respective TV production companies, who reserve all rights.